The term “credit spread” might sound confusing because it’s also the name for a trading strategy used by hedge funds and institutions in fixed income markets. When talking about options though a credit spread is something else entirely. A basic credit spread involves selling an out-of-the-money option while simultaneously purchasing a further out-of-the-money option. These setups can be traded on both the call and put side. On the call side, it is used to express a bearish or neutral perspective. Yet it can still yield a profit even if the price of the underlying increases slightly. On the put side, the credit spread is used to express a bullish or neutral perspective. It can still produce a profit though in the event of a minor sell off. For example suppose you have a slightly bearish outlook on natural gas (NG). So you would receive $340 on the short call, and would pay $85 on the long call. This trade results in a net credit since the premium on the option sold is higher. This is because it is closer to the money (more on the Greeks). The credit received is determined by: (price of the option sold) minus (price of the option bought). For this particular example, you would receive a net credit of $255.00 (minus fees). 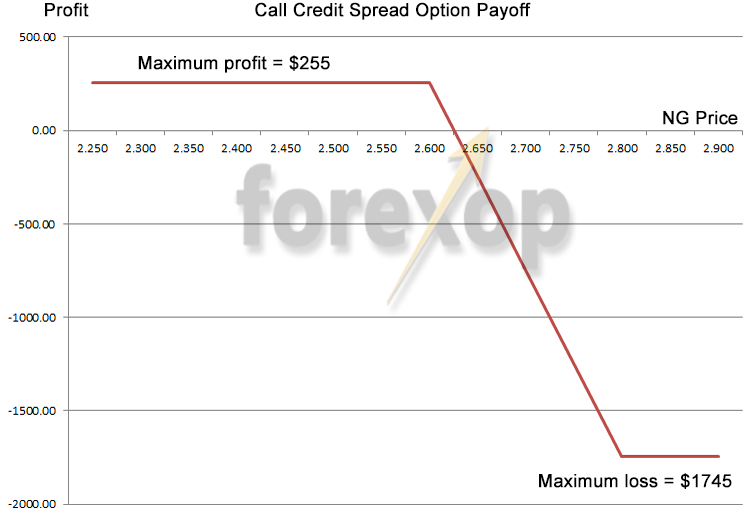 The maximum loss for this position is the width of the strikes between the sold and bought options, minus the credit received for placing the trade. If, at expiration, both of the options are in-the-money, the trade will be a full loss. However, if both of the options are out-of-the-money, the trade will be at maximum profit. The diagram below shows the payoffs. Similar to a credit spread, a debit spread is always placed for a net debit. This means instead of receiving a physical credit in his account like for a credit spread, a trader will actually have to pay to buy a debit spread. Essentially, a debit spread is the opposite of a credit spread. 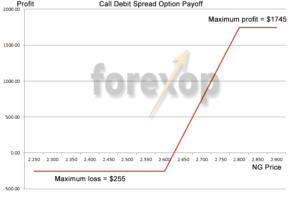 A debit spread, involves purchasing an out-of-the-money option while selling a further out-of-the-money option in the same expiration series for an overall debit to the account. The aim with debit spreads is that the system will increase in value by becoming closer to the price of the underlying and, hopefully, be in-the-money at expiration. This would yield full profit. Call debit spreads are used to express a bullish perspective, and put debit spreads are used to express a bearish perspective. The diagram shows a bull call debit spread using the same scenario as above. The iron condor is a play on the credit/debit spread. It is comprised of either a call and put credit spread, or a call and put debit spread. 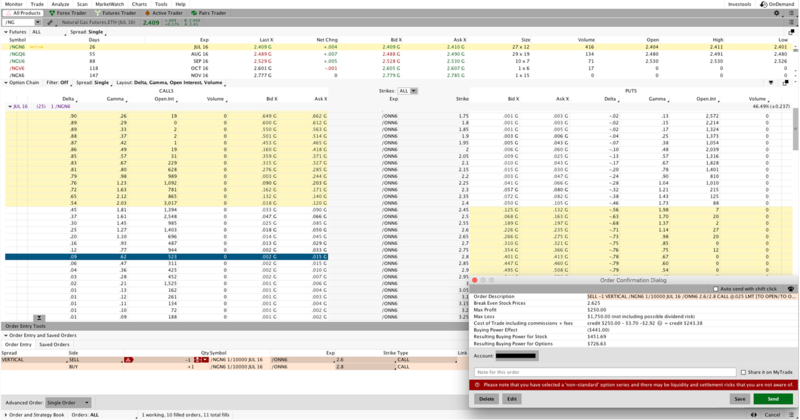 A short iron condor involves selling a call credit spread and a put credit spread, all in the same expiration month. The short iron condor is always done for a net credit, while the long iron condor is always done for a net debit. For the short iron condor to reach maximum profit, the price of the underlying must be within the short call and put strikes. Additionally, the short iron condor, when placed properly, can be a delta-neutral strategy, meaning it’s insensitive to the direction the underlying instrument moves. Because of this, it is commonly used to express a neutral outlook on an underlying. However it can still produce a profit with small moves up or down in the underlying. For the long iron condor, the way the maximum profit is achieved is slightly different. 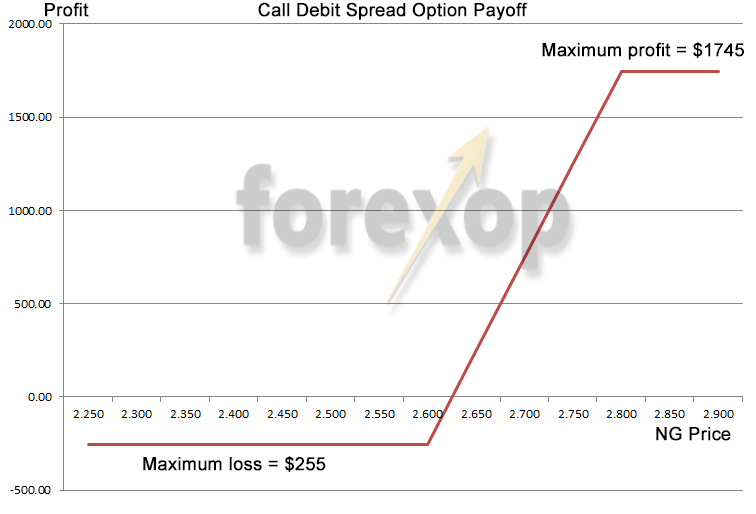 It’s physically impossible for both of the call and put debit spreads to expire in the money. So the total cost of placing the long iron condor must be less than the value of either call/put debit spread at expiration. Because of this, it’s often necessary to choose strikes for the long iron condor very far away from the money, which requires large moves in the underlying to make a profit.